This panel bed with storage showcases a transitional and vintage style. Crafted from hardwood solids and cherry veneers, the piece features an upholstered bench footboard for extended seating and side cubby storage to accommodate all of your bedroom needs. 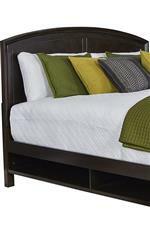 A wonderful bed, this piece is an elegant addition to the modern bedroom setting. 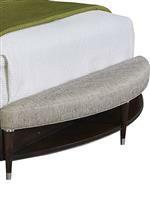 The Vibe Queen Panel Bed with Bench and Cubby Storage by Broyhill Furniture at AHFA in the area. Product availability may vary. Contact us for the most current availability on this product. 4257-460 Queen-King Cubby Storage Side Rails 1 81.5" 18.8125" 17.125"
4257-250 Full-Queen Panel Headboard 1 64" 3" 54"
4257-253 Queen Uph Radius Bench Footboard 1 64" 13" 18.5"
Case Construction Hardwood solids with cherry veneers. The Vibe collection presents a contemporary and transitional style meant to impress. Featuring tapered legs, metal-capped feet, cedar-lined drawers, built-in USB chargers, touch lighting and extended storage, these furnishings showcase modern and accommodating design. The furnishings are crafted from beautiful solid hardwoods with exquisite cherry veneers and completed with a rich, dark finish. A wonderful way to transform your home for years to come, the Vibe collection's unique style will stand the test of time. The Vibe collection is a great option if you are looking for Transitional furniture in the area. Browse other items in the Vibe collection from AHFA in the area.